Hebh Jamal does not remember the Sept. 11 attacks. She was 1. 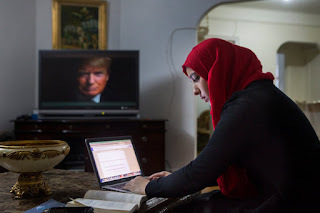 Growing up in the Bronx, she was unaware of the invasions of Afghanistan and Iraq and was mostly insulated from the surge in suspicion that engulfed Muslims in the United States, the programs of police surveillance and the rise in bias attacks. But in the past year, especially in the past several months, as her emergence from childhood into young womanhood has coincided with the violent spread of the Islamic State and a surge in Islamophobia, she has had to confront some harsh challenges of being a young Muslim in America. Instead of occupying herself with a teenager’s normal concerns, like homework, clothes and hanging out with friends, she said, she has had to contend with growing anti-Muslim sentiment, adjusting her routines to avoid attacks and worrying about how she appears to the rest of society. And she has repeatedly felt compelled to justify her faith and to distance herself from terrorists who murder in the name of her religion. Ms. Jamal is part of a generation of Muslim Americans who have grown up amid the fight against terrorism, in an America in which anti-Muslim hostility, by many measures, has been historically high. 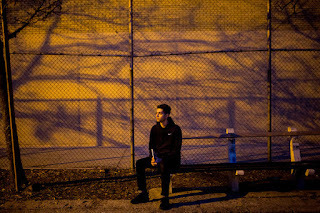 Young Muslim Americans, on top of the usual trials of adolescence, have been forced to grapple with profound questions of identity, society, politics and faith in a country that has had an ambivalent relationship with Islam. The complexities and pressure have left many young Muslims feeling isolated and alienated, if not unwelcome in their own country. These challenges have only multiplied in the past year as violent events around the world have fueled or reaffirmed anti-Muslim feelings in the United States and elsewhere: the terrorist attacks in Paris; the killings of three Muslim students in Chapel Hill, N.C.; the San Bernardino, Calif., killings; and Donald Trump’s proposal to block the entry of all Muslims into the United States. Muslim children and young adults have been buffeted by prejudice and politics, much of it playing out on social media, and parents and counselors have grown concerned about the toll this has taken. Farha Abbasi, assistant professor of psychiatry at Michigan State University and an expert in Muslim mental health, said that since the Sept. 11 attacks, young Muslims in the United States have dealt with “chronic trauma” from the constant stress of anti-Muslim sentiment. “On top of that, you have acute stress since the Daesh attacks started, and all the frenzy,” she said in an interview, using the Arabic name for ISIS. The world’s Muslim population, an estimated 1.6 billion people spanning continents and cultures, defies generalization. So do the experiences of Muslim Americans who have lived most, if not all, of their lives since Sept. 11. But a body of scholarship that has emerged in the years since then has described the extraordinary challenges facing the youngest members of the Muslim American population as they navigate complex identities while their communities are scrutinized as potential terrorism threats. “Being exiled from the moral community you thought you were a part of is really stunning,” said Michelle Fine, a psychology professor at the Graduate Center of the City University of New York, who has studied Muslim American youths since Sept. 11. She equated the feelings of shock and exclusion to those experienced by Japanese youths after their internment in the United States during World War II. Even amid the diversity of New York, which has an estimated Muslim population of at least 600,000, anti-Islamic harassment has been a part of the landscape, especially since Sept. 11, Muslims say. “If a Muslim hasn’t been called a terrorist in middle school, lower school or high school, then they’re probably in a really great school — and I’m happy for them!” Ms. Jamal said. 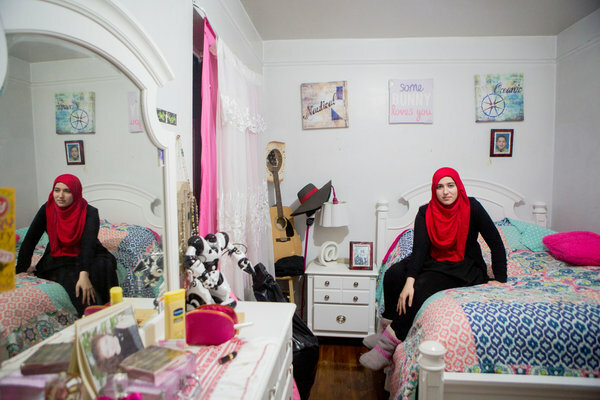 “I remember seeing micro-aggressions that my mom faced because she wore a hijab,” said Jensine Raihan, 17, a student at Townsend Harris High School in Queens. She, too, wore a head scarf when she was younger, but after enduring “weird” looks and treatment that she attributed in part to the garment, she took it off. “I didn’t feel comfortable anymore,” she said. . But others have had an opposite response, seeking to reaffirm and declare their ethnic and religious identity. Over the course of her teenage years, Zayneb Almiggabber, 19, who was born and raised in the New York area, has had both responses. 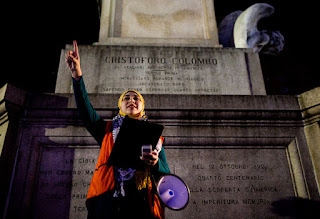 “The reality is that I’m just as Muslim and just as Arab as I’m American, and it’s possible to be all three,” she said. In recent weeks, instead of shrinking in the face of growing anti-Muslim sentiment, she has redoubled her conviction to publicly embrace the complexities of her identity, as has her younger brother, who is in high school and has been feeling a backlash from his classmates. Young Muslim Americans are finding support and resolve in Muslim student clubs in high schools and colleges, and at mosques and Islamic youth centers. On college campuses, Muslim activists are building coalitions with other social action movements — like Black Lives Matter — to address shared grievances of inequality and prejudice. In the years after Sept. 11, many Muslim Americans who were coming of age experienced a civic awakening in the crucible of the backlash, a trend charted in academic research. The trend has continued among the youngest Muslim Americans, as events and discourse, amplified by social media, compel them to wrestle with weighty social and political questions. Much of the conversation has played out on social media, which young Muslim Americans have learned can cut both ways. It has been a useful tool for organizing people and for reaffirming a sense of community, but it has also been a weapon of anti-Muslim sentiment. 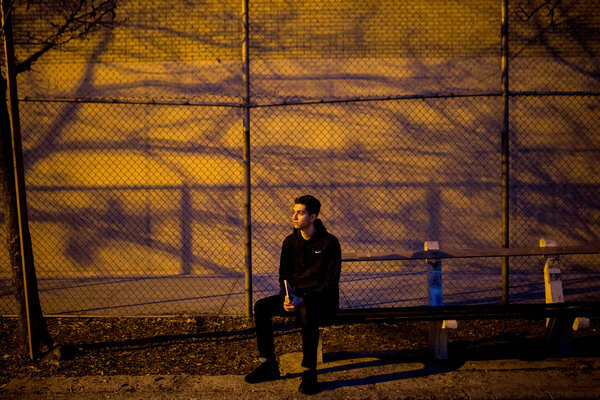 For many young Muslim Americans, the struggle of this era — to understand what is happening to them and their community, to figure out how to respond, to manage fear, to remain buoyant and vital and alive — has been a lot to handle at such a young age.